The attention was firmly on the Mercedes duo for the entirety of the race as tensions continued to rise. Behind them, a frantic afternoon of running unfolded, with retirements aplenty, several safety car periods and even a handful of overtaking. Teams moved in and out of the points, and there were penalties for not taking penalties correctly. The only thing the race didn't have was rain! If you need a recap of any of the action, or missed what happened on a specific lap, the Factbyte Factbox highlights might be of use! Nico Rosberg wins the race, leading throughout despite several safety car restarts. Lewis Hamilton finishes second, with Daniel Ricciardo chasing him to the line. Seven drivers retired from the race, including Vettel, Vergne and Bottas who all had power unit issues. Pastor Maldonado failed to start the race after not getting away for the formation lap. Jules Bianchi scores Marussia's first points in Formula One, finishing ninth. F1 friends, welcome to the Factbyte Factbox for the Monaco Grand Prix. If excitement about the race itself wasn't enough, there's talk of rain to mix things up. 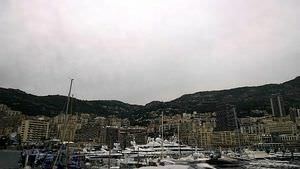 Tweet from @clubforce: "Overcast and cool over the harbour - will it rain? Will it not? Odds are on the "not", but conditions can change very quickly here... And mind, we base our observation on a highly specialised meteorological method known as "looking out the window". Accurate and reliable." Naturally there's a lot of focus on the dynamic between Lewis Hamilton and Nico Rosberg but not much has changed since yesterday - they're lining up on the front row, and both want to get ahead of the other. Meanwhile, Kimi Räikkönen missed his driver parade duties, resting up due to some stomach problems. Hopefully he'll be fit enough to put the pedal down later. Rosberg absolutely dominated last year at Monaco, topping every single session, grabbing pole position and winning the race. The only thing he missed out on was the fastest lap. He's hoping to repeat that this year, and starts from a somewhat controversial pole. Not the gorgeous blue skies we've come to know! The Toro Rosso pair did a good job in qualifying, particularly Daniil Kvyat who has never even been to Monaco before. Sergio Pérez outqualified his teammate to nab a top ten grid slot, whilst Kevin Magnussen also made it into the top eight, at the expense of the other McLaren. Marcus Ericsson was given a penalty after qualifying yesterday, the Caterham driver causing a collision with Felipe Massa. As he was at the back of the grid anyway, the stewards opted to force him to start from the pit lane, rather than use an ineffective grid drop. Jules Bianchi has today picked up a five place grid drop after the team had to change the gearbox on his Marussia car. He'll be last on the grid, with Ericsson catching up with the pack as soon as possible after the start. The pit lane has opened, the cars are roaring out to make their way round a sighter lap to then line up on the grid. No practice starts in Monaco, there's just no room at the end of the pit lane. 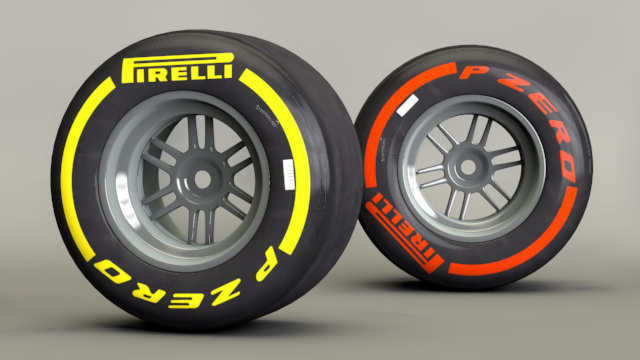 The tyre selection this weekend is between the yellow soft tyres and the red supersofts. The track is relatively easy on the tyres, and Pirelli have said one stops are possible and likely. The grid is absolutely packed with drivers, engineers, media and anyone else trying to get a patch of space! Niki Lauda reveals that Lewis Hamilton was a "little bit funny" this morning, not accepting the apology from "the other one." Lauda also says the start will be supremely important but if they get into any trouble with each other, he won't be happy. Max Chilton is the lead back marker of the four cars, and is feeling confident: "We didn’t have a great qualifying but we’re ahead of the Caterhams, as long as we can stay ahead of them in the first corner, I think we’ve got the upper hand on them. I’m looking forward to seeing what Monaco brings." Adrian Newey: "We’ve just got to run our own race and take advantage of any opportunities that arise. I think Daniel was slightly disappointed after qualifying, with Sebastian we had a problem that cost him some lap time. We came out of qualifying slightly disappointed but nobody’s done race pace here yet, so we don’t know where we stand in a race situation." The sun has actually come out over the track, things are brightening up as the minutes count down to the race start. Rosberg leads the cars away for their formation lap. Hamilton is slower off the line, but soon regains his second place. Pastor Maldonado doesn't move away from the grid, the Lotus mechanics rushing in to attempt to get that car moving. The top ten drivers are starting on used supersoft tyres, Räikkönen and Pérez have done one extra lap than the rest. Hülkenberg in 11th is on the soft tyres, as are Sutil, Chilton, Bianchi and Ericsson. The mechanics have recovered Maldonado's car to the pit lane, and manoeuvred the Lotus to the pit exit to line up alongside Marcus Ericsson. Rosberg gets a great start off the line, Hamilton has to slot in behind for second. Ricciardo is passed by Vettel and Räikkönen, dropping back to fifth. Yellow flags as one of the Force India cars is in the barrier. The safety car comes out. Pastor Maldonado never did leave the pit lane, as we see more shots of Sergio Pérez's Force India stricken out on track. Grosjean and Sutil have both taken the opportunity to pit. Replays show Pérez didn't leave quite enough room for the car behind him, and was collected and tipped into a spin. More replays of the start show it was an incredible start for Kimi who just put his foot in and didn't blink. Ricciardo didn't go anywhere off the line, hence his drop down two places. The marshals have recovered the Force India now, pushing it off track, so the circuit should be clear soon. It looks like it was Button that was in the vicinity of Pérez during the collision, but there aren't any good camera angles of what happened. As the safety car is reported to be coming in, Hamilton airs his concerns on the radio over the rapidly dropping tyre temperatures. Rosberg attempts to back up the pack to get a jump away for the restart, but Hamilton sticks with him. They're racing again as Vettel has dropped all the way down the order. The Red Bull has a problem. Team radio to Vettel: "Sebastian, go to mode 8." Vettel comes into the pit lane, and there's some frustrated radio that tailed off: "Come on guys.... well, I'm sure you're trying everything." Vettel is back out on track, avoiding retirement this time round. He is, of course, last now and down a lap. The car is sounding absolutely awful as Vettel reports he's stuck in first gear. Turn 5 incident involving Sergio Pérez and Jenson Button will be investigated after the race - causing a collision. Vettel is instructed to retire the car, he pulls into the pit lane and the car is lifted up and pushed back into the garage. Race over for the defending champion. Hamilton is keeping tabs on Rosberg out front, the gap is just under seven tenths between the pair. They've already got four seconds up on Räikkönen. Adrian Sutil, who is superb at overtaking drivers at the hairpin, does exactly that, moving ahead of Romain Grosjean for 18th place. Grosjean is slightly out of place, having pitted under the safety car. Incident involving Max Chilton, Jules Bianchi and Esteban Gutiérrez under investigation - cars out of position on the grid. Kvyat has come in to the pit lane and is out of the race, disappointing after a great qualifying. With four retirements already, Kamui Kobayashi is up in that fabled 13th place that might make the difference between the Caterham/Marussia battle. Sutil does his hairpin move again, this time on Marcus Ericsson. The Sauber driver is now up to 16th. Out front, the gap has extended slightly with Rosberg up 1.6 seconds - breaking the DRS, not that it was effective anyway. Thermal imaging on Daniel Ricciardo's car show just how little tyre temperature there is, the rubber is totally black through any and all straights, registering just a splash of colour/heat around the corners. Team radio from Hamilton: "I already feel my rears going." There's a very visible gap appearing between the two Mercedes now, and they in turn have pulled out a lead of 8+ seconds on Kimi Räikkönen. The Ferrari is having a lonely race, with Ricciardo a further 4 seconds away. Sutil is certainly earning his hashtag #SuperSutil, by overtaking Max Chilton at the chicane at the exit of the tunnel. Huge squeal from the tyres as Rosberg locks up into Mirabeau - this time avoiding the run off area and continuing without causing controversy. 5 second stop/go penalty for Jules Bianchi, Max Chilton and Esteban Gutiérrez - out of position on the grid. Ricciardo is attempting to close the gap to Räikkönen, he's managed to claw it back to less than three seconds. We're heading rapidly towards the first round of pit stops, with drivers pushing their tyres to the limit. At the front, it's a question of who will blink first - Hamilton or Rosberg? Rosberg has caught up to Romain Grosjean, the blues flags start to wave as the race leader moves forward to begin lapping the backmarkers. Grosjean comes into the pit lane for his second pit stop of the race. Adrian Sutil's impressive run of form comes to an abrupt end as the Sauber is sitting in the run off area at the chicane at the end of the tunnel, minus a good portion of carbon fibre. Replays show he locked up over the bumps, whacked into the wall on the left hand side, and ended up with no front wing and a tyre hanging off. The Safety Car is coming out, as there's a lot of debris to be cleared as well as the Sauber itself. There's a part of the front wing sitting right in the middle of the track after the chicane, the debris continuing onwards after the car had come to a stop. With the safety car out, most drivers are taking the opportunity to pit. Those with five second penalties have to take them now. Mercedes double stacked their cars, Hamilton held back perhaps a little bit too much so as not to be delayed in the pits. It didn't work out, though, as he had to wait for a passing Räikkönen before he could be released. Vergne was released directly into the path of Magnussen, the epitome of an unsafe release. The McLaren driver hit the brakes and avoided a collision, but the Toro Rosso narrowly avoided collecting a Williams crew member as well. Hamilton is complaining on the radio: "I can't believe we just had to pit. Please inform me what my next option is." He's told he's racing to the end on these tyres, it will be down to managing degradation or an intervention by the weather. Felipe Massa hasn't stopped, he's up in fifth place at the moment. Everyone else has stopped at least once, as Kimi Räikkönen comes in for a second stop! The Ferrari driver is now at the back of the pack, which is a disaster, after running so well in third. Busy times in the pit lane. Incident involving Jean-Éric Vergne and Kevin Magnussen under investigation - unsafe release. Weirdly, the FIA have put that it's Kvyat they are investigating, but he's not actually in the race anymore. Also, what is there to be investigated, it was the worst unsafe release I've ever seen! Track is clear - the safety car pulls off and the action resumes. Rosberg retains his lead on the restart, with Hamilton behind. Ricciardo is back up to third, by way of Vettel's retirement and Räikkönen's double stop. On the entrance to the tunnel, Hülkenberg somehow steals a march on Magnussen and sweeps up to seventh place. Magnussen was probably distracted, having passed Vergne on the previous lap but too early ahead of the safety car line. He had to give the place back. Magnussen now down in 8th. Kimi Räikkönen attempts a move on Kamui Kobayashi going into the post-tunnel chicane, but locked up and cut the corner. He ended up having to let the green car go. Drive through penalty for Jean-Éric Vergne - unsafe release. Coming out of the tunnel, Kobayashi got it all wrong, locking up the tyres and missing the chicane. He has to surrender the position to Räikkönen. With the momentum gone, Jules Bianchi takes the opportunity to muscle past the Caterham, quite literally bumping his way ahead and into 13th place. Kobayashi is warned to take care not to cut the chicane. He's under pressure from Romain Grosjean now, as they approach that part of the track again. It's clean this time, Grosjean remains behind. Vergne takes his drive through penalty, rejoining the track in 13th. Jules Bianchi was side by side with the Toro Rosso at the pit exit, but manages to stay ahead, moving up to 12th. Sauber have just one car remaining in the race, but Esteban Gutiérrez is currently running in tenth place, just inside the points. The team could desperately do with their first points this season. Replays show Grosjean passing Marcus Ericsson, the Lotus now ahead of both Caterham cars. Somehow Ericsson is ahead of his teammate Kobayashi as well, but we didn't see what happened there. Team radio to Nico Rosberg: "Nico, fuel will become critical if you don't start using longer gears." Max Chilton gets all out of shape coming through the swimming pool section, chasing down a clearly struggling Kobayashi. Massa is still running strongly, over halfway on the tyres he started with - supersoft compounds, now 43 laps old. Reportedly, Kimi Räikkönen was hit by an errant Marussia and picked up a puncture, hence his extra stop that forced him down the order. He's back up to 11th now, though. Massa looks like he's fighting to keep control of that Williams now, he must be about to pit. And there he goes, 46 laps in. 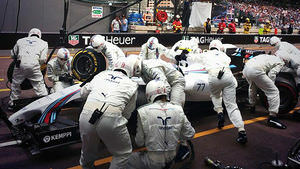 A clean stop by the Williams team, and Massa rejoins the pack in 11th place, splitting Kimi Räikkönen and Jules Bianchi. Hamilton is fed a shed-load of information about the techniques Rosberg is using to save fuel, where he is lifting and coasting, where the weak spots are. The gap between the pair is now just about eight tenths of a second. Vergne closed right up to Bianchi around the hairpin, there was contact at the apex as the Marussia was slow away. A little carbon fibre went flying there. Rosberg has pulled the gap out to 1.2 seconds now. The fight is ebbing and flowing between the pair. There's blue smoke pouring out the back of Vergne's car. Safety car averted as Vergne just managed to get back to the pit lane. He pulls into the garage and it's race over. The fuel consumption graphic shows Rosberg on 55kg, with Hamilton on 53kg. Magnussen also has high consumption, matching Rosberg's 55kg back in sixth place. Team radio to Rosberg: "The fuel situation has stabilised, keep doing what you're doing." Gutiérrez is still running in the points, ninth place for the Sauber driver at the moment. However, he's being hunted by Kimi Räikkönen which could drop him down to tenth. There's a train of cars forming behind Valtteri Bottas. Replays show the Williams driver cut the chicane and didn't give the place back. It matters not as Bottas stops out on track, blue smoke pouring from the back of his Mercedes engine. The car is stopped on the outside of the hairpin. The crane is moved in, the marshals are working very quickly to recover the car without the need of the safety car. Meanwhile, the seven retirements so far has seen Jules Bianchi up in to eleventh place. That's crucial for Marussia. Just one place away from the points, too. Crofty fact: It's the first time this year that Bottas hasn't scored points in a race. Incident involving Jules Bianchi under investigation - serving 5 seconds penalty while the safety car deployed. Forget all I said about Bianchi maybe getting into the points. All those who took their five second penalties may have done it at the wrong time. According to a hopeful Massa's team radio, Gutiérrez is also under investigation, which could ruin Sauber's points finish. Yellow flags as Esteban Gutiérrez has spun into the barriers. Points gone out the window for Sauber! Replays show he just got it totally wrong at Rascasse, clipped the barriers and spun it. That does put Bianchi up into tenth place, but he's under investigation. The marshals are crowding onto the track to clear the Sauber, such brave guys as the cars continue to circulate. Track is clear after some efficient work from the marshals. Bianchi is told over the radio he's in the points, is doing a good job, but needs to be wary of Grosjean behind - who is potentially in a better car. Kobayashi comes into the pit lane for his second stop of the day. Ricciardo sets the fastest lap of the race so far - 1:19.316. There's always a lot of credit for Max Chilton and his finishing rate. He's three laps down at the moment. But still running. 5 second stop/go penalty for Jules Bianchi - taking the previous penalty when the safety car deployed. He doesn't have to come into the pit lane again, if he gets to the end of the race the five seconds will just be added on to his time. Hamilton reported on the radio that he's dropping back as he's got some dirt or something in his left eye and he can't see anything. That must be uncomfortable! Bianchi needs to maintain a five second gap over Grosjean, then. At the moment it is three seconds. Team radio to Button in 7th: "You can see Hülkenberg in real trouble with his rear tyres, we expect him to stay out. You will need to watch for Räikkönen coming up behind." Max Chilton has come into the pit lane for the third time, and he's back on his way. Team radio from an angsting Lewis Hamilton: "I don't care about Ricciardo, I want to know what the gap is between me and Nico please." Tweet from @lukehmuse: "Asks for the gap, gets given the gap. Still not right. #lewisproblems"
Ricciardo is told that Hamilton has "problems with his vision", that he's going faster than him and it's very possible he could chase him down and catch him. The gap is 3.4 seconds. Ricciardo can see Hamilton ahead of him now, and the pair are approaching some traffic that will need to be lapped. It's not just lapped cars, actually, it's a really close train of cars that are all fighting each other for the lower end of the points. Jenson Button surges past Kevin Magnussen, even as the pair are moving out the way of Hamilton and Ricciardo. Yellow flags as Kevin Magnussen and Kimi Räikkönen pulled to a halt at the hairpin. The Ferrari attempted an overtake that didn't work out. Kimi Räikkönen got caught up with the McLaren, and has been back in the pit lane for a new front wing. Jules Bianchi is up into eighth place now, so even with the five second post-race time addition, he should still be in the points! Incident involving Kimi Räikkönen and Kevin Magnussen will be investigated after the race - causing a collision. Ricciardo has closed the gap to just four tenths of a second to Hamilton. Only two laps left though. There's only four cars left on the lead lap, as Kimi Räikkönen sets the fastest lap of the race on fresh tyres, down in 12th place. Nico Rosberg wins the Monaco Grand Prix! Ricciardo fought right to the bitter end but there were just no opportunities to overtake. Still a great third place finish for the Red Bull driver. Rosberg winds his way round the streets of his home town, celebrating over the radio and of course being instructed to pick up rubber, etc. Marussia are celebrating their first points in Formula One, they should finish ninth with their five second penalty. Two points for the team! Lewis Hamilton takes his time getting out the car, as Rosberg takes on the Pirelli hat and waves to the waiting crowd. Rosberg accepts the trophy from Prince Albert, and he waves it over his head, one happy driver. Hamilton comes in to pick up his own silverware, there hasn't been any interaction between the two Mercedes drivers yet. Finally, Ricciardo comes in to get his third place trophy, and there's that big smile. Now for the anthems. The champagne sprays out. Hamilton is rubbing his eye a little bit, he does look a bit blinky. The two Mercedes drivers celebrate their relative success separately. Podium interviews - Nico Rosberg: "A very special day. Lewis drove really well and pushed me massively hard so the pressure was on all the way. I kept it cool and was able to win, in the end pulling a bit of a gap as I had the fresher tyres. Fantastic, and very happy for the whole team. It’s an amazing car they’ve built this year." Podium interviews - Lewis Hamilton: "It was a good day, really good for the team to get a 1-2. I had great pace, obviously I felt I was very strong today. It’s a difficult circuit to overtake. Fortunately we didn’t make any mistakes." Podium interviews - Daniel Ricciardo: "Firstly, it’s really nice to be up here on the podium in Monaco. The start was not great, I dropped back to fifth actually. Bit of frustration but then we saw Vettel had a problem, I saw Räikkönen had a puncture. We sort of inherited third. At the end, we really closed in. I believe he had an issue, tried to put some pressure on but in the end third was the best we could do." Tweet from @Marussia_F1Team: Points, ahead of Sauber AND it's his home race! With all his family and friends here! Interview with Graeme Lowdon on the safety car penalty: "It’s really difficult, because we were planning the stop and through no fault of our own there’s a safety car. We took the penalty anyway… the rules were a bit unclear on that. We thought we would just take penalties and keep going, we could see this was going to be our opportunity. The guys did a really good job." Some champagne is being carried into the Marussia garage now, a spot of celebrating is about to take place! Toto Wolff on Hamilton's unhappiness at the strategy choice: "I think we need a new piece of equipment in the garage, a crystal ball. His only chance on overtaking Nico was in the pit stops. When the safety car came out in our pit window, it was clear our race was finished. In Monaco, it’s always tricky, when you see a car going off to know if there will be a safety car or not." A jam-packed race in Monaco is done and dusted then. Mercedes will still garner all the headlines, but we should also take note of the Renault power unit problems, and the high attrition rate here. Sutil's incredible overtaking skills were all for naught, and great disappointment for Sauber after yet another double DNF - their third of the year. Marussia will have a superb amount of momentum going into Canada, which could also spring a surprise but it seems unlikely they can do it again just yet. The gap is still there to the midfield, but when there are opportunities they might be able to take them. Things looked like they were going well for Magnussen but it all came undone towards the end of the race, he lost out to Button and then got caught up with Räikkönen. It'll take a while to pick apart all the pieces that made up this great afternoon of action, but stay tuned to Sidepodcast for the news and views between now and Canada. Thanks for sharing this race with me!